For a millenium, the Children of Amarid have served the people of Tobyn-Ser. Drawing upon the Mage-Craft, which flows from the psychic bond they forge with their avian familiars, the Mages of the Order have fulfilled their oaths by healing the injured and ill, repelling invasions by the land’s enemies, and caring for the people in times of crisis. They are governed by laws handed down by Amarid, the first of their kind, who committed the Mage-Craft to the people’s protection. Only once in a thousand years has a mage defied those laws. Theron, a contemporary of Amarid, sought to use his powers to gain wealth and glory. For that he was punished, though not before he brought down a terrible curse on his fellow mages and all who would come after them. Recently, dark rumors have spread across Tobyn-Ser. Children of Amarid have been seen destroying crops, vandalizing homes, massacring men, women, and children. Have the mages forsaken their oaths? Has Theron returned from beyond death to take his vengeance? Or does Tobyn-Ser face a new threat, one it is ill-prepared and ill-equipped to face? With the land in turmoil and faith in the Mage-Craft badly shaken, it falls to Jaryd, a young mage with extraordinary potential, but little knowledge of the power he wields, to find and destroy Tobyn-Ser’s enemies before they destroy all he holds dear. 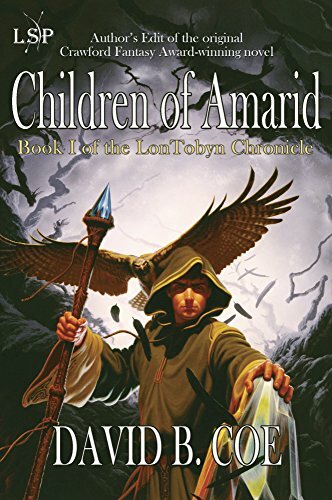 CHILDREN OF AMARID is the first volume of the LonTobyn Chronicle, David B. Coe’s Crawford Award-winning debut series. This is the Author’s Edit of the original book. I was asked if I was interested in doing this book and I said yes because it had been awhile since I had done some straight science fiction. I was intrigued by reading the Forward in the beginning of the book. I rarely ever read these but since this was an editing of the original book I decided to see what the author had to say. Mr. Coe calls this version an “Author’s Edit” which is like the “Director’s Cut” of a movie. He went back and fixed a few things that bothered him once the book had been published. The result is pretty amazing. I had a hard time putting this book down. I would classify it as an epic fantasy without being too wordy. The author is able to create a really wonderful world that has history without bogging you down in pages and pages of description and history. I love epic fantasies but I have to be in the right mood to read them because very often they are too much to take in after a day of racking my brain at work. Somehow, Mr. Coe has taken a brilliant fantasy and brought it alive without it being 1000 pages. I loved the characters. They are all well developed and never boring. Jaryd is a young mage who is taken into training. We learn about the mage world through his eyes and training, so we learn as he does. This is how the author was able to keep my attention during the “how the world works” parts. What I loved most is that since this book was originally written years before the new trend of cliffhanger endings, we have a complete story. This book is the first in a trilogy but we have a complete story. The ending does leave an opening for the next book because we do not completely win the war but you definitely are not left unfulfilled by the ending and so frustrated you want to throw the book against the wall. I was very happy with the ending. I loved this book and when I was finished, I immediately started book two. This is definitely a keeper and will find a permanent spot on my bookshelf. “Jaryd, look.” What he heard in Alayna’s voice chilled his blood. He knew what had come before he turned. He heard it in her tone; saw it in the shrinking fear that twisted her features as she stared over his shoulder, her eyes wide and her cheeks ashen. The grove appeared brighter than it had a moment before. He knew what that meant as well. Pivoting slowly, Jaryd saw a diffuse green light moving toward them through the trees, shimmering like moonbeams on a windswept lake, and clinging like rain to the branches and leaves so they themselves seemed to glimmer. Had he not been standing in Theron’s Grove, Jaryd would have thought the sight as beautiful as the shifting curtains of light that graced the autumn sky on the night of Leora’s Feast. As the green glow drifted nearer, Jaryd discerned a figure walking at its center, its aspect vague at first, but gaining substance with each step until he could make out certain details: a long, full beard, and thick, shoulder-length hair that might have been gray if not for his green radiance. Deep lines creased his face, but he carried himself like a young man, straight-backed and alert. On his shoulder, as spectral and luminous as he, sat a large falcon with a dark head and back, and markings on its face that made it look mustached. And in his hand, the man held a long, wooden staff, the top of it splintered and charred. “Should we run?” Jaryd breathed, never taking his eyes off the ghostly figure. Jaryd couldn’t argue with her logic. As the specter continued to coalesce, his eyes sharpened, like sunlight burning through a mist. They were hard and bright as cerylls, and they gleamed with the hatred and bitterness of a thousand years. Seeing those eyes, feeling themselves encompassed by the baleful gaze, Jaryd and Alayna quailed. And in that instant, they heard for the first time the voice of Theron’s unsettled spirit. Four years after the insidious, devastating invasion by agents of Lon-Ser, Tobyn-Ser's Order of Mages and Masters is riven by conflict and paralyzed by inaction. 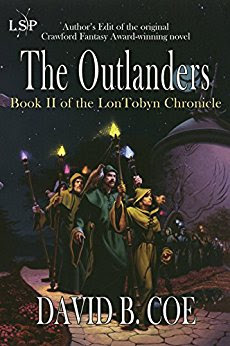 From the outlander, Baram, they have learned much about their neighbor to the west: Unlike Tobyn-Ser, which is served by the Mage-Craft of the Children of Amarid, Lon-Ser is devoid of magic. Instead it possesses a dazzling and deadly technology that shapes every aspect of its people's daily life. Frustrated by the Order's inability to act, Orris, a young, rebellious mage, takes it upon himself to prevent further attacks on his homeland. Taking Baram from his prison, he embarks upon a perilous journey to Bragor-Nal, an enormous, violent city in Lon-Ser, ruled by a brutal, feudal-like system of Break-Laws, Nal-Lords, and Overlords. As Orris soon learns, however, Baram has been driven insane by his captivity. Upon reaching his strange and fractured homeland, the man abandons Orris. THE OUTLANDERS is the second volume of the LonTobyn Chronicle, David B. Coe's Crawford Award-winning debut series. This is the Author's Edit of the original book. I immediately picked this book up after finishing book one. Book two is a bit different from the first. In this second edition, we get to see not only the world of Tobyn-Ser but also the mysterious world of Lon-Ser, a world with no magic. In this novel, we are not following a new mage just learning his craft but a little bit older mage, one who has competed his training. He is still young and rebellious. Orris was a character in the previous book so we come into the story knowing about him and maybe not quite liking him. He was not my favorite character in the first book but by the end of this one, I loved him. He definitely gets redemption in this book. I definitely loved this book even if I skimmed over some of the beginning parts. It had been a rough day at work and the first couple of pages were a little too wordy for me but once I got to the meat of the story, I was sucked in and had a hard time putting it down. Again, this is a complete story. No big dramatic cliffhanger ending. I cannot wait for book three. Melyor nodded. “I understand. I’d do the same, were I in your position.” But even as she spoke, even as she assented to her own death, she felt the familiar tranquility coming over her, taking her to the still point within her that she had come to know so well over the years. Savil was speaking again, saying something about how disappointed he was that they wouldn’t be going up to his flat after all. But she barely heard him. And by the time he raised his thrower to fire, she had already started to move. Ducking her head as the spurt of red flame hissed from his weapon and passed over her shoulder, she pivoted on her right foot and spun, swinging her left foot in a wide, violent arc. Savil had begun to move as well, twisting his body, as she knew he would, to shield what would have been Melyor’s most obvious target. And so, in mid-turn, she adjusted her attack--just enough to catch him full in the kidney with the hard point of her toe. The Nal-Lord crumpled to his knees with a retching gasp, his eyes squeezed shut. His weapon flew from his hand and clattered on the wet pavement. Barely able to remain upright, he struggled to free his knife from the sheath on his thigh. Before he could, Melyor struck him again, this time driving her fist into his throat, shattering his larynx with the blow. He toppled onto his back, laboring for each breath with a terrible, rasping sound, and staring at her with wide, terrified eyes. The Nal-Lord tried vainly to climb to his feet, and she moved closer, looking down at him with pity and just a shade of disdain. “I have one other thing to share with you before I kill you: It’s a secret. I’ve told people before, but only just before they die--that way it remains a secret. Think of it as a tradition.” She paused, took a deep breath, and she spoke the words, just as she had so many times before. She took some satisfaction in the way his eyes widened at what she said, and so killed him quickly, with a single burst of thrower fire to the heart, rather than prolonging his death as she did sometimes with those who had angered her. After that it was but a simple matter to find her way out of Savil’s Realm and back to the safety of her flat. There, she removed the blue lenses, slipped out of the body scarves, and washed the curls and color out of her hair. She fell into bed, exhausted, but pleased with the way her evening had gone. I should hear from Cedrych tomorrow, she thought. The day after at the latest. She smiled in the darkness, and, closed her eyes to drift toward sleep. Only then did she realize, with a small pang of regret, that she had forgotten to reclaim her dagger. I've been dabbling in fantasy more in the past couple years so I'm going to be checking the first one in the series out. I love good fantasy. :) Feel free to shoot me some recommendations. Thank you! These are so much fun! Thank you so much for the kind reviews. Very glad you enjoyed the books!